“My husband has a nine-year-old child from his first marriage. He hasn’t seen his son for over two years because he’s been living overseas, but he’s now back in the UK and my husband is keen to see him. “I’m happy for him but I think his ex-wife is messing us around a lot. She makes arrangements with us then frequently changes these at the last minute. I’ve also found out that she never has anything good to say about us, nor the things that we arrange for her son. “Last week, we had planned to take his son to a film premiere in London. However, when we turned up to collect him, she told us that he couldn’t go because her parents were visiting and they wanted to spend time with their grandson. Why she couldn’t have told us this before we even set off, I don’t know! “You’ve been very honest with me about your feelings, so why haven’t you said these things to your husband? You wouldn’t believe how many letters and email I get from people whose relationship is in trouble, yet they can’t or won’t talk to their partner. “I know you’re fed up with his ex-wife’s behaviour, but try to see this situation from your husband’s perspective. He hasn’t seen his son for two years and, whether this is his fault or not, he is probably feeling very guilty about this. Given this, it’s no wonder that he is desperate to be with his son as often as possible. So much so that he is prepared to overlook his wife’s unpredictable and inconsiderate behaviour. “It’s also possible that he avoids confrontation with his wife because he doesn’t want to further upset his son, who may still be struggling to come to terms with his parents’ divorce. So while you should try to not judge your husband too harshly, you shouldn’t let this situation fester any longer. 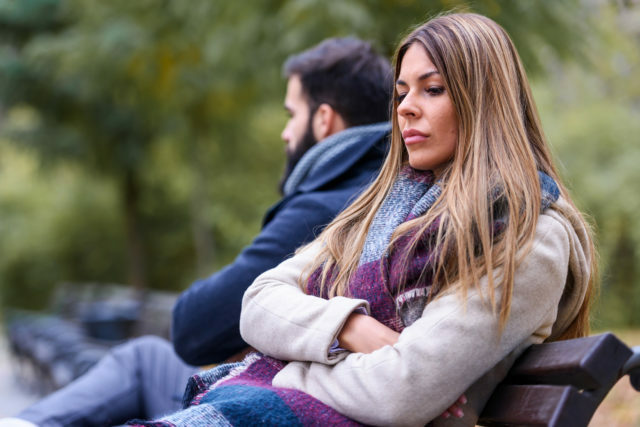 As you’ve been distant with each other for a few days, he is probably all too aware that this is having a knock-on effect with your marriage, so you need to talk – and soon. “Say to him the things that you’ve written to me, and show that you’re willing to support him at this difficult time. If you show him you care about him, and get him to see that you only snapped at him because you’re so angry with his ex-wife, then I am sure you can find a way to not let this spoil your relationship. And if you really can’t get this conversation started, or you can’t resolve the issues, please consider talking to a Relate counsellor (relate.org.uk). :: If you have a problem you need help with, email Fiona by writing to help@askfiona.net for advice. All letters are treated in complete confidence and, to protect this privacy, Fiona is unable to pass on your messages to other readers. Fiona regrets that she cannot enter into personal correspondence.